Although the main text is in Latin, there are a series of added notes in Irish at the end of each Gospel which provide the scribe's name: Mael Brigte Ua Mael Uanaig; his age: 28; the fact that he was writing in Armagh; and the date of completion: 1138. In the 13th century further academic notes were added, which suggest that the book was used for study in the new university of Paris. 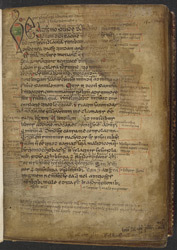 The text on this page is a prologue which begins 'Beatissimo pape'; the first three letters are larger than the main text, and are written in descending size ad degree of elaboration.